After Ragdoll Cannon, Ragdoll Cannon 1.5, Ragdoll Cannon2, Ragdoll Cannon Remake and Ragdoll Cannon Level Pack, here is Ragdoll Cannon 3, the latest installment in the popular physics-based puzzle series created by Johnny K.
The goal remains unchanged: shoot the ragdoll man from the cannon and make him hit the “Here” button to activate the next level option. Expect 15-20 minutes to complete the game. 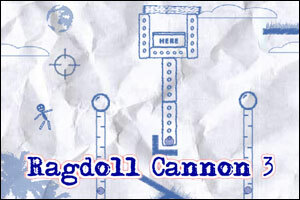 Ragdoll Cannon 3 video walkthrough! Bubblebox server seems to be down right now. Please try again later. Posted on Sunday, June 13th, 2010. Follow any responses through the RSS 2.0 feed.